I missed calling Connecting Threads in time to buy the Batik Paradise Cabin Windows Kit. It included a free pattern. Today I called the company to see if I could access the free pattern and was told to just keep watching the website. I looked online for a Cabin Windows pattern, and the ebooks wants me to download a credit card # for a free pattern! I don't know if the pattern is the same or not. Any advice? I could sit down with graph paper (ugh!) and figure it out, but wondered if anyone had a better, quicker idea. And what's with the credit card number? Is that how it's done to download free ebooks? Free? Or...set me straight, friends. Just no bashing my ignorance, okay? Thanks! P.S. I don't mind paying for a pattern, but would like it to be very similar to the CT pattern. Is there a way to contact the co by email or phone to ask about it? I've never heard of having to download a credit card # for something that's free. I don't blame you for being wary. Google takes me to a site called "goBookee" or something similar (may have the caps wrong) and wants me to register through Facebook. I don't do Facebook and am not really interested in starting. Just want the Cabin Windows pattern. No other companies/sites seem to have this pattern. I would like something similar/close, but have no ideas on other comparable patterns. Guess I'll just keep looking at CT and hope they post it. call again. get a different representative who knows more. you should be able to get it without Facebook. I don't do facebook either and never will. good luck. I buy a visa gift card in a certain amount to buy things on line especially if I am apprehensive about using the site. I tried to find the pattern you're talking about and had no luck. When I google it, I see a preview, but the website says it's unavailable. Can you post a link? Thanks, Thimblebug, for the link. I dont' know how to do those & yesterday we were having our Internet changed over to higher speed, so wasn't able to be on QB much. Yes, the pattern I'd like is the one in the upper left hand corner with the black background and brights. Thanks, everyone, for helping with this. I'll wait until Monday and see if I can get a different rep at CThreads. I'm not attracted to many patterns, but this one I like! :-) Again, thanks for all the help. Love this board! Last edited by dnorton; 05-18-2013 at 05:00 AM. 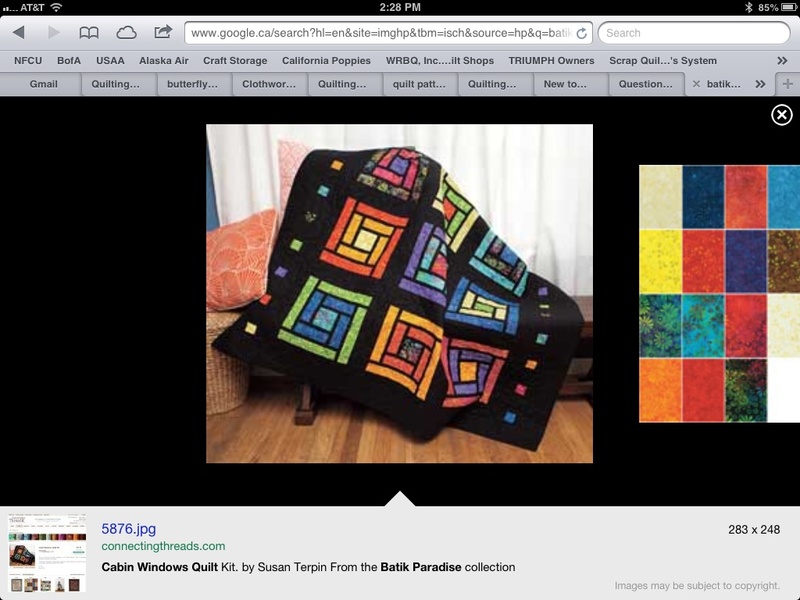 That quilt is going on my bucket list of quilts to make. 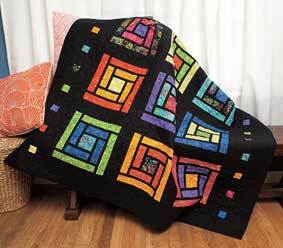 Another quilt I want to make. I'm wondering after looking at that picture again, if those are just fused coloured shapes onto a black background? If they are, decide your colours, fuse the fabrics and then you could just decide how big you want your finished size or easier to start with a certain size middle square, leave a ½" or ¼" black space & measure & fuse the next shape & build your log cabin out to the right size. Last edited by thimblebug6000; 05-18-2013 at 07:09 AM. That main block is just a modified "Log Cabin." You could make one block just by cutting long strips (you decide the width) and sewing each one on, going in a clockwise direction, then cutting the ends off as you go. After your block is done, take it apart and voila!...you have your pattern. I would first sew the black strip onto the colored strips and then cut the lengths. Make a log cabin as usual using the strip set as one piece. The black is only on one side of the log, the black on the other side of the log is from the next log in place. You even see that the last go around has narrow black only on one side. Last edited by jeank; 05-18-2013 at 02:42 PM. What a great idea. .. Thanks for the heads up...I will be doing this if I order from new online companies. Thanks, Tropit and Jean. I think you're right. It will be fun to experiment! Inspector: I do think the site that came up was a scam. Why else would they need a credit card # if the pattern is free? That is just goofy! anyone had a better, quicker idea. Or...set me straight, friends. Just no bashing my ignorance, okay? Thanks! P.S. I don't mind paying for a pattern, but would like it to be very similar to the CT pattern. Start by 2" strips of your color fabrics and 1" strips of black. Then cut 5" center squares. Sew the black 1" and 2" strips together to make strip sets. Cut the first (inner strip set) to 6-3/4" - you need four for each block. You will have a partial seam on the first strip you sew to the center block. Then rotate around the block until you can finish the partial seam. Cut the second (outer strip set) to 9" and sew around the block as before. You end up with a 12-1/2" finished block. Sashing looks to be about 3" or 4" finished. Last edited by catmcclure; 05-19-2013 at 05:10 AM. I just noticed that Connecting Threads posted on their Facebook page that their entire team is going to Quilt Market on Monday, so I wouldn't be surprised if they are a little harder to reach than usual, but I'll bet they'd really like to know about this problem. I'm sure they don't want to annoy people who are likely to go on this forum and share their difficulties. I've always had good luck with them. I think they meant the pattern was free with the kit. If the company or someone from the company asking you to upload your credit card, run as fast as you can. That to me sounds like a scam, don't ever upload a credit card unless, you want someone making charges to your card. My credit card company alerted me to that fact a month ago, (not from Connecting Thread Co) that someone had charged first $150.00 to my card and another $99.00 dollars a week later. Thank goodness I have insurance on my credit card, if anything's going on, they contact me. I didn't have to pay any of this. My credit card was cancelled and a new one issued. Good Luck!!! I agree with the above. You should always be careful using your credit card online. However, that being said, I've never, ever had any problems with Connecting Threads. I order from them all the time and I know that they are legit. They are a wonderful company to deal with. I would call them and ask them to explain the, "free pattern" offer. The pattern was free with the kit. Due to life happening, I didn't get to order the kit before it sold out. So that was my bad. CT weren't the ones asking for me to pay for the free pattern. It was another site that I'd Googled hoping to get the pattern elsewhere. I was hoping CT would post the pattern on their site. To date, that hasn't happened and yes, CT folks are probably at Quilt Market. Catmcclure (post #18) gave some directions that sound like they'll work. Sorry if I confused anyone. CT isn't at fault. I am for not ordering quickly. I don't do ANY social media-the US government watching my emails is enough for me. I found that out by mistake- it was so weird that they were watching my email to my BFF on my brown bread recipe. You shouldn't have to give a CC# for a free download. Sounds fishy to me. Connecting Threads has a free Attic Windows block you can download. I could not find the Cabin Windows block per the picture someone else posted link to. Connecting Threads is usually consumer friendly--just give them a call or email and ask.